An internationally important collection of cider apples, with almost 300 different varieties, has been given to the National Trust to help secure its future and stop many of the rarer varieties becoming lost forever. Slack-ma-Girdle, Netherton Late Blower and Billy Down Pippin are just three of the apple varieties in the 'National cider apple' collection established over the course of more than 25 years by collector and donor Henry May. A process of propagation began last year to allow the trees to be moved from the Tidnor orchard in Herefordshire to one of eight National Trust properties. At least two trees of each variety not already in the Trust's care have been propagated at the conservation charity's Plant Conservation Centre and, where possible, will be planted in the county that they originated from in Somerset, Gloucestershire, Devon, Dorset or Herefordshire. David Bullock, Head of Nature Conservation for the National Trust, said: “To be given this collection is a fantastic privilege. The National Trust is committed to looking after and protecting traditional fruit orchards, which are not only a beautiful spectacle for visitors to enjoy, but are incredibly important for many species of insects, birds and plants. Orchards are important habitats for nature and species such as mistletoe, mistletoe moth, the mistle thrush, bullfinch and corky fruited water dropwort in the grassland call these special places home. The trees are expected to begin bearing fruit in around seven years' time, when it is hoped that many of the apples will be used to produce cider. In 2007, traditional orchards were designated a priority habitat under the UK Biodiversity Action Plan. The habitat has declined rapidly since the 1950s, with more than 90% of our traditional orchards in England lost in 60 years. Steve Oram, Orchard Biodiversity Officer for the People's Trust for Endangered Species, helped to arrange the gifting of the national collection of cider apples to the National Trust. Steve said: “When I spoke to Henry May about his desire to pass on the collection, I knew that the National Trust would have the expertise and, importantly, land to look after this collection, protecting its future. “Orchards are a mosaic habitat which contain elements of woodland, pasture, meadow grassland and are often bordered by hedgerows. This combination of habitats means that you have a unique wildlife haven supporting a vast range of species. One National Trust property receiving part of the collection is Montacute House in Somerset. A recent conservation study of this Elizabethan property revealed that the 19th century aspects of the estate were once home to several fruit orchards. Now, thanks to the donation, 95 varieties of the cider apple trees will be planted in the grounds, helping to restore this historic landscape feature. 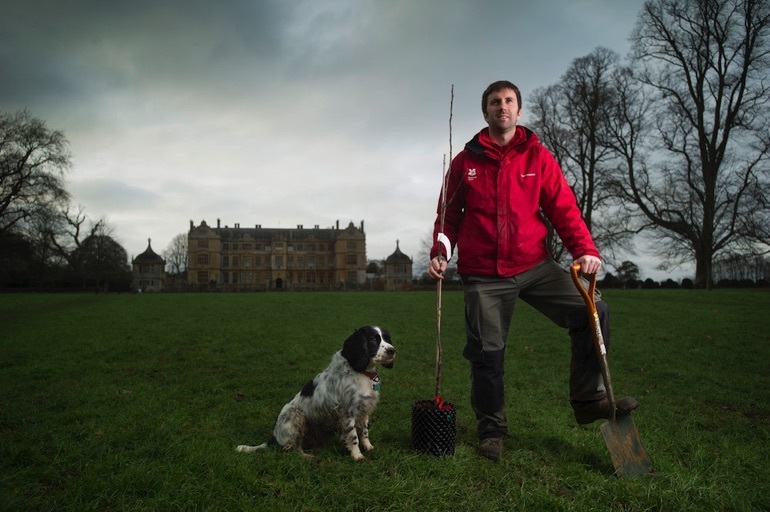 Area ranger, George Holmes, who is leading on the project at Montacute, said: “Over the past few weeks we've been preparing the ground ready for the arrival of these trees. We've also been busy building the tree guards that are needed to keep the young tree trunks protected from any damage that would weaken the trees or make them susceptible to diseases. The National Trust looks after more than 100 orchards across its gardens and 250,000 hectares of countryside. To see the new collection of cider apple trees, which will be planted over the next year, you can visit Killerton, Devon; Brockhampton, Herefordshire; Montacute, Somerset; Tyntesfield, North Somerset; Barrington Court, Somerset; Glastonbury, Somerset; Westbury Court Garden, Gloucestershire and Golden Cap, Dorset. Supporters wishing to help the National Trust continue to look after its traditional fruit orchards can donate £20, which allows the conservation charity to purchase one heritage variety apple tree.